The Suvarnabhumi Airport T2 by Duangrit Bunnag Group, will feature giant tree-like wooden columns and an indoor garden with cascading waterfalls, referencing Thailand's tropical landscape. As part of Bangkok’s Suvarnabhumi airport’s third phase of development, the construction of its second terminal is projected to receive over 30 million passengers per annum: 12 million via domestic flights, and 18 million via international flights. With the development of the new terminal, the airport gross capacity (Terminal 1+Terminal 2+Satellite Terminal) is projected to reach 90 million per year. It is envisioned to have 14 airport aprons and parking spaces with a capacity of 1,000 cars, all of which are expected to take about 30 months to complete in time for the target year of operation in 2021-2022. To realize this plan, the Airports of Thailand Public Company Limited (AOT) invited four practices to bid for designing the second terminal. The construction costs are earmarked at approximately 35 billion baht. The declared winner of the bids, Duangrit Bunnag Group or DBALP Consortium (in collaboration with Nikken Sekkei, EMS, MHPM, MSA, and ARJ Consortium), set their proposal at around 329 million baht, and the design referencing Thailand’s lush forests and landscapes. In reference to the country’s tropical landscape, the consortium designed the new space to immerse the passengers in a forest-like setting. It comprises two modular structures measuring 36×36 meters and 18×18 meters, supported by distinctive wooden columns towering like giant trees meeting at the ceiling like that of a forest canopy, and will cover a total 348,000 square meters. Inside the new terminal building will be an indoor forest spanning 16,132 square meters featuring a tropical landscape with a cascading waterfall. 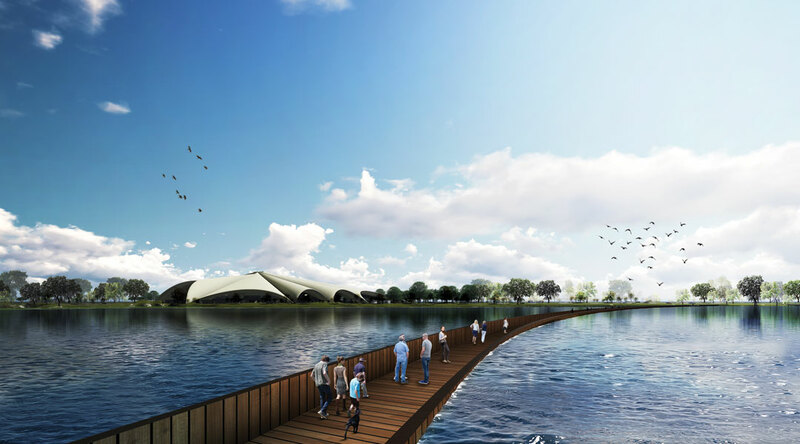 Although there have been comments that the winning design ‘copies’ or resembles Kengo Kuma’s Yusuhara Wooden Bridge Museum in southern Japan, DBALP Consortium claims that their scheme is reminiscent of their previous works. Transportation details will include inter-terminal driverless APM, airport rail link, and high-speed train (eastern line). DBLAP Consortium’s bid for Suvarnabhumi Airport Terminal 2 design was announced the winner on 22 August by the AoT, after the disqualification of the original winner, SA Group (comprising SPAN Consultants and Sign-Tech Engineering Consultant Co). According to AoT, SA Group failed to submit the original quotation for the design cost given by the AoT. Construction is expected to start late 2019.